The WPF Ribbon control is a command bar. It helps to create Office-like Ribbon Menu UIs with application menus or backstage, buttons, combo box, gallery, and more. The WPF Ribbon control (ribbon menu) accommodates all the tools required for an application in a single, easy-to-navigate user interface similar to Microsoft Office. 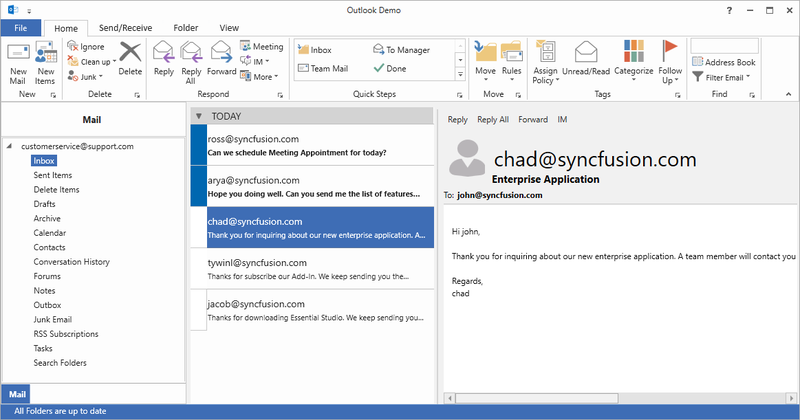 Its dynamic resizing, keyboard accessibility, and complete customization options help organize an application. Office 2016 UI - Provides a backstage view. Available color schemes are White, Colorful, Dark Gray, and Black. Ribbon Touch UI - Supports a touch UI with plenty of interaction space. Office 2010 UI - Supports gradient colors and color schemes that include Blue, Black, and Silver. Office 2007 UI - A classic interface that contains three color schemes: Blue, Silver, and Black. The Ribbon control for WPF comes with a variety of ribbon items. Button items—like the ribbon button, drop-down button, and split button—can be included in any of the three different types of states. The Ribbon control can also include the following controls, making it comprehensive yet flexible: CheckBox, ComboBox, RadioButton, Ribbon Gallery, TextBox, and ListBox. All these controls can be separated using the ribbon separator. Ribbon button - A button with three different sizes to display content with images. Drop-down button - Displays menu items for selecting commands. Split button - Performs like a normal button as well as a drop-down button to select a command directly or from a list. Ribbon gallery - Displays items in a row- or column-based view by category. Items can be represented with any type of content: text, images, etc. Ribbon ComboBox - Helps to select items from a drop-down list. Ribbon ListBox - Displays a list of items. Ribbon Radio button - Allows a single selection from multiple options. Ribbon CheckBox - Allows one item or multiple items to be selected. Ribbon TextBox - Normal TextBox control in a ribbon UI. Modal tabs in the Ribbon control are used to temporarily display a collection of commands other than those found in the core tabs. When shown, all other core tabs will be invisible. In Microsoft Office, modal tabs are used to display print-preview commands when printing a document. QAT positioning - Place the Quick Access Toolbar either above or below the ribbon. Add items to the QAT - Users can add frequently accessed commands to the QAT. Custom QAT - Customize the QAT window by adding, removing, or reordering items. Custom ribbon tab - Users can create a new ribbon tab by adding commands. The Ribbon control for WPF allows users to customize a control’s state, such as the Quick Access Toolbar, the minimize-maximize state of the ribbon, the ribbon tab, etc. This requires the customized state to persist across application instances and when the app closes. Upon restarting, the app will again apply the state. Mini-toolbar - The mini-toolbar is a lightweight, floating toolbar that can be dynamically displayed and hidden in certain contexts. A good example is text editing. When users select text in the editor, you can display a mini-toolbar next to the text to quickly let users bold, italicize, or underline it. Ribbon status bar - Display the current status of an application or document, similar in Microsoft Office. Launcher button - The launcher button allows users to execute an action they define. Tab-panel item - Display controls under the close button using a ribbon’s tab-panel item. Supports super tooltips, which are used to customize the default look and feel of all tooltips.